Beautiful glossy pictorial hardback with silver ribbon bookmark. Full color images inside! 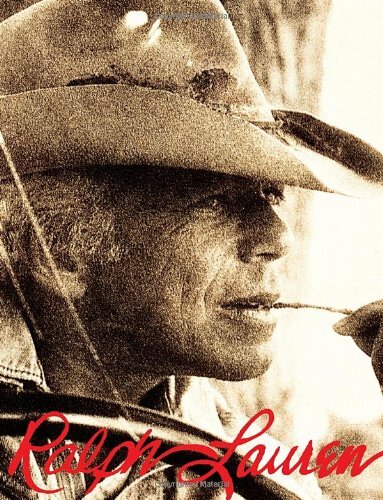 Ralph Lauren isn’t easy to define. Unlike many designers, he is not known for a single signature look, but rather for his sweeping dreams of American living. Over the course of his career, the images of luxury, adventure, and beauty that he created have come to define American style. In this visually stunning book, Lauren speaks candidly for the first time ever about himself and his art. In part one, we get to know the designer through never-before-seen pictures of him in private life and with his family, living the lives he designs for. In his own words, we hear about his life, work, and inspiration. In the second part, Lauren displays and writes about his most important, most iconic, and most beloved work, hand-picked from hundreds of runway shows, collections, and his signature cinematic advertising campaigns. Lauren’s aesthetic influence and unique design sensibility are captured here by fashion’s finest photographers, including Bruce Weber, Deborah Turbeville, and Patrick Demarchelier. Featuring an introduction by Audrey Hepburn (from her 1992 presentation speech at the CFDA awards), this is truly a unique fashion monograph, a personal expression of the artist, and a rare peek into the mind of one of America’s most accomplished fashion designers of all times. Ralph Lauren began his career in 1967, designing neckties under the label Polo. Today, his collections include menswear, womenswear, accessories, fragrance, and home. He has received numerous awards for his work in fashion, philanthropy, and humanitarian causes, and is the only designer to receive the CFDA’s four highest honors: Womenswear Designer of the Year, Menswear Designer of the Year, Retailer of the Year, and Lifetime Achievement.